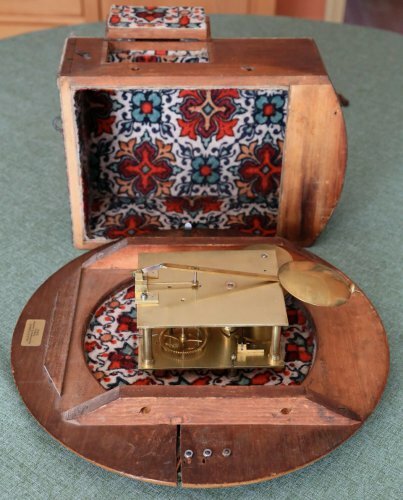 “Freemasons have existed in the town since the 1730s, following the formation of the first Grand Lodge in London in 1715. With the spread of the Lodges from London, a second tier of management, the Province, was set up and in 1772 the Province of Suffolk was instituted. 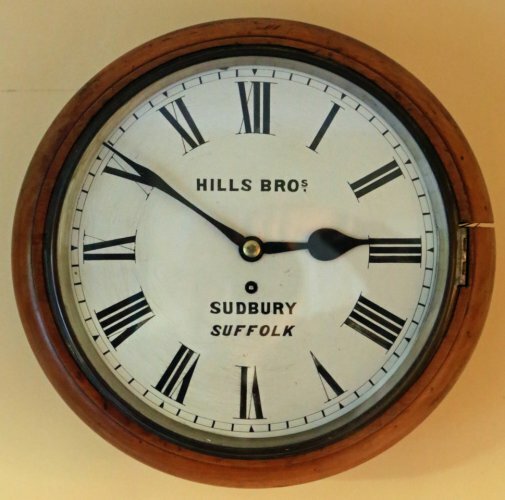 As the population of Suffolk grew in the 19th century, the number of Lodges grew from 14 in 1813 to 22 in 1900, and at present there are 64 Lodges. Spread throughout Suffolk, all accept the regulations laid down by Grand Lodge, but are supervised by the Provincial Grand Lodge of Suffolk. 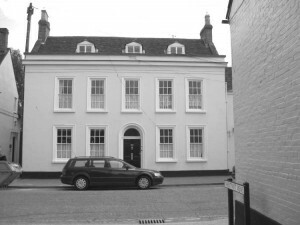 The earliest local Lodges were the Social Lodge of Bocking no. 411 which met at the White Hart Hotel (and appeared to be the haunt of the nobs with lawyers and the like) and the Philanthropic Lodge of Long Melford no. 528 which was favoured mainly by the area’s trades people. This probably met (and dined!) 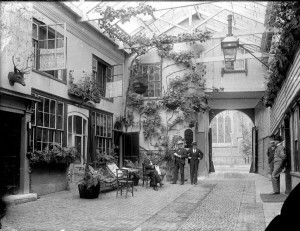 in Sudbury in the Rose and Crown Hotel (destroyed by fire in 1922 and now the site of Winch and Blatch). Various other local Lodges came and went. Our oldest extant lodge, Stour Valley no. 1224 was formed in 1868 by local builder Thomas Holland (who erected the large timber factory behind the Conservative Club) and other local businessmen and farmers. They first met over Martins the printers but soon moved to the Institute Club, situated where the ATM machines now service Barclays Bank. 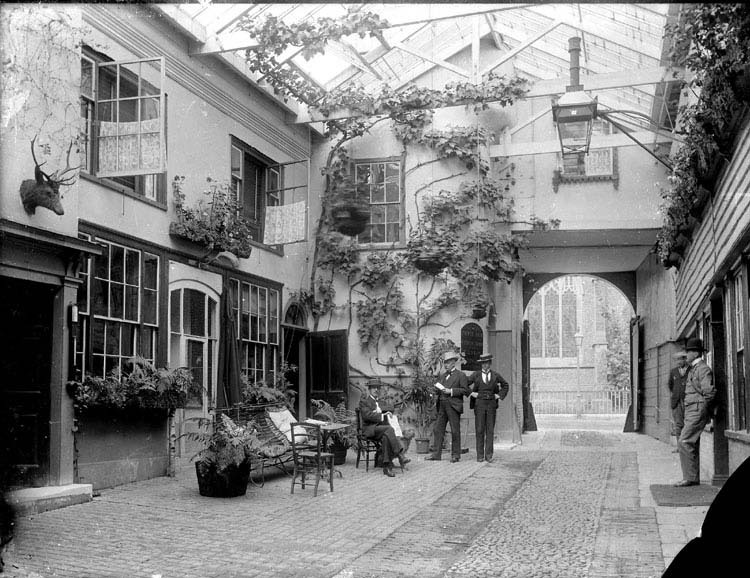 The interior courtyard of the Rose and Crown, destroyed by fire in 1922. Winch and Blatch department store is built on the site. In 1886 another local builder Frederick Jennings, a member of the Lodge, built the current Hall as the Masonic Temperance Hotel. 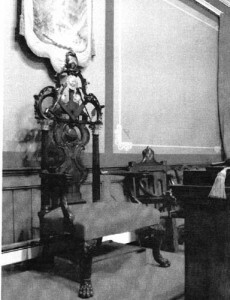 The Freemasons had the use only of the Temple and a small ante-room, even after they purchased the freehold in 1919 for £700. Freemasonry continued to thrive in the town with the formation of two further Lodges, Priory no. 4618 in 1924 and Babergh no 8122 in 1967. 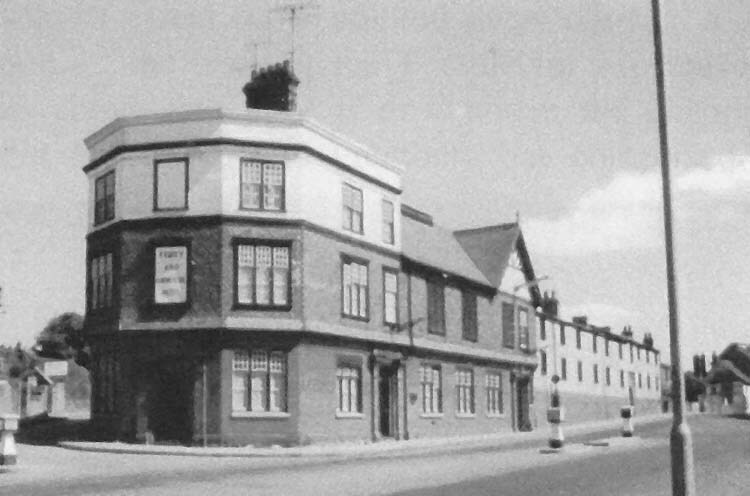 With no dining facilities the members frequented mainly the now defunct Rose and Crown, and later the Four Swans Hotel in North Street, also no longer with us. The Masonic Temperance Hotel, now the Masonic Hall, pictured before its modification by Messrs Grimwood in the mid 19th century. The Mount cottages are beyond the Hotel. In 1935 the trustees purchased the adjoining row of cottages, ‘The Mount’. By 1967 it was apparent that the facilities were both inadequate and becoming structurally unsound. With two sizeable bequests and the decision to demolish the cottages and sell the land, further money was pledged by the brethren. That year the Lodges held their meetings at Clare while Messrs. Grimwoods completely rebuilt and refitted the Hall’s interior. The original grand entrance facing onto the Melford Road was sealed, chimney pots removed and a new Girling Street doorway installed. However, great care was taken to preserve the fabric and tiled exterior of the building. Since 1968 the Hall, although kept in good decorative order, has scarcely changed and still preserves much of its earlier Victorian lustre, especially in the Temple. Generations of local families have celebrated weddings, birthdays and festivals there, and hopefully will continue to do so. Local Freemasons have always been at the forefront in our town, taking their civic duty seriously. At least a third of the Borough’s Mayors were of the Craft, as were many Magistrates, Chairmen of the Licensed Victuallers and other societies. The elaborately carved Worshipful Master's chair: the Lodge owns some of the finest Chippendale chairs in existence. The most famous and, probably, our most distinguished member was the Revd Charles Martyn, rector of Holy Trinity at Long Melford. A Suffolk man, with the advantage of a rich mother and even richer wife, he became the most generous local benefactor of Victorian times. Responsible for rebuilding the tower at Holy Trinity, building St Catherine’s in memory of his wife (to spare the ladies of the parish the long one-mile uphill walk to Holy Trinity) and establishing the school associated there with the church, his generosity extended to Sudbury as well. 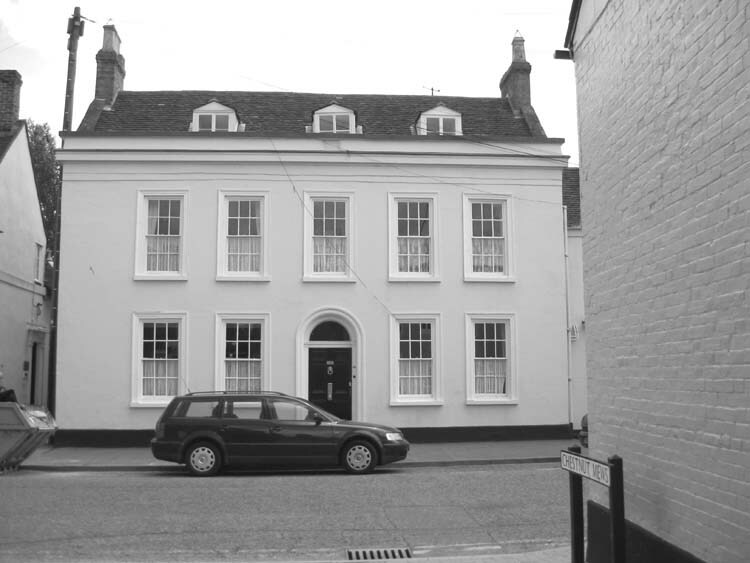 The house in Friars Street which housed the savings bank where Pratt worked. Many local people deposited their savings there, trusting Pratt implicitly because he was both a banker and a Freemason..
A recently published book by Peter Thorogood, Brother Whence Come You (£15, pp. 174, heavily illustrated), tells their story and that of the Hall. This book is available from the author (all profits to charity) on 01787 379050. *The story of this Victorian scandal is also told in Allan Berry’s Suffolk Country Town: a Sudbury Miscellany (Sudbury Freemen’s Trust, 1997), pp. 131-142.